BV028. 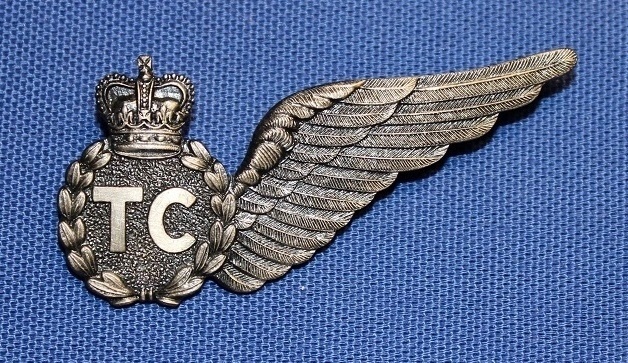 A solid back silver brevet for an Air Electronics officer with clutch grips and no markings. BV028. Back view of brevet. BV077. 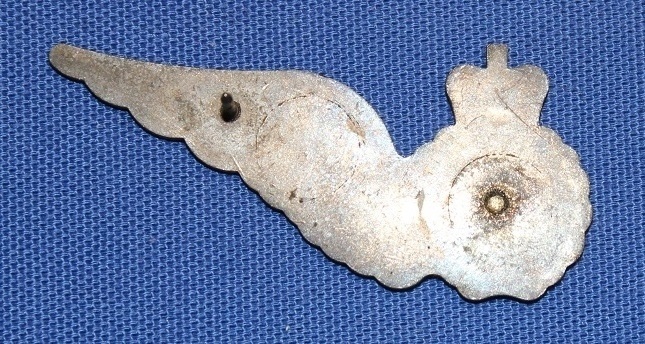 A hollow backed sterling silver brevet for a Crewman with a broach fitting. 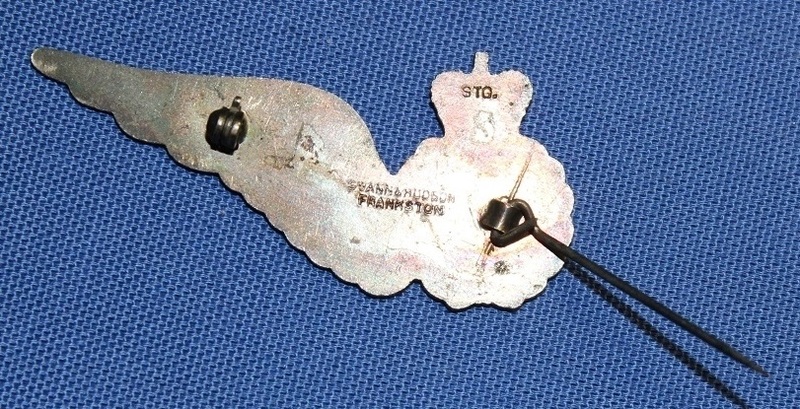 The brevet is marked "STOKES (A,ASIA) STG.SIL"
BV077. Back view of brevet showing markings. BV078. A hollow backed sterling silver brevet for a Signaller with a broach fitting. The brevet is marked STG.SIL. STOKES & SONS 1955"
BV078. Back view of brevet showing markings. BV079. 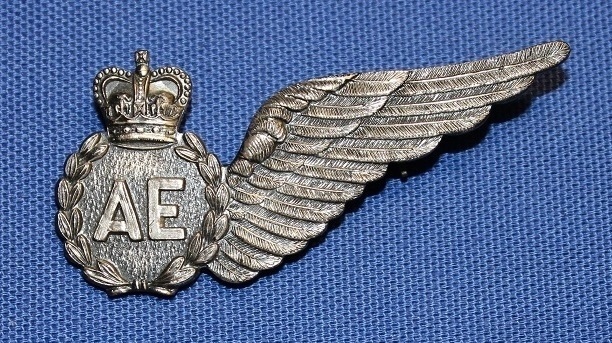 A solid back silver brevet for an Air Electronics officer with a broach fitting. 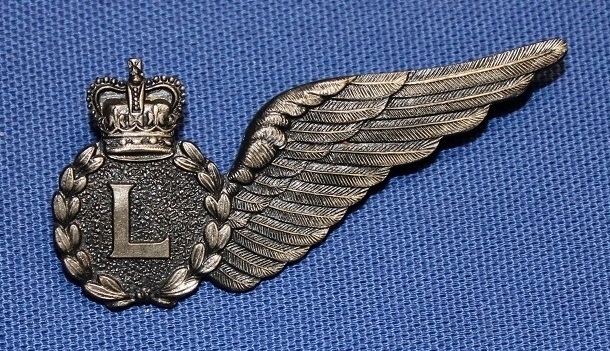 The brevet is marked "K.G.LUKE STG.SIL." BV079. Back view of brevet showing markings. BV080. A solid back silver brevet for a Gunner with a broach fitting. the brevet is marked "STGSIL BRIM"
BV080. Back view of brevet showing markings. BV081. A hollow backed sterling silver brevet for a Navigator with a broach fitting. 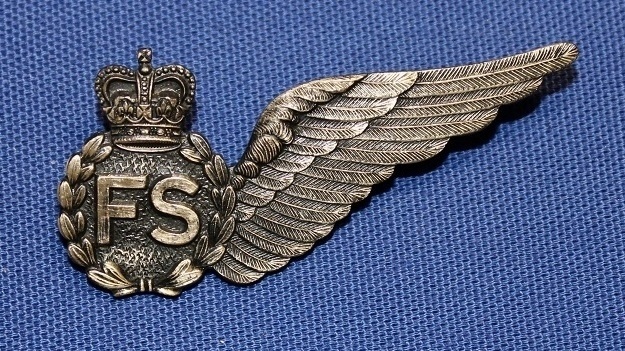 the brevet is marked "STG.SIL. STOKES & SONS 1955"
BV081. Back view of brevet showing markings. BV082. 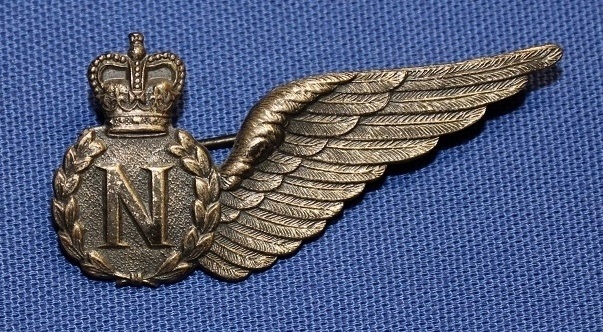 A solid back silver brevet for a Technical Crewman with a broach fitting. The brevet is marked "SWANN & HUDSON FRANSTON STG." BV082. Back view of brevet showing markings. BV083. 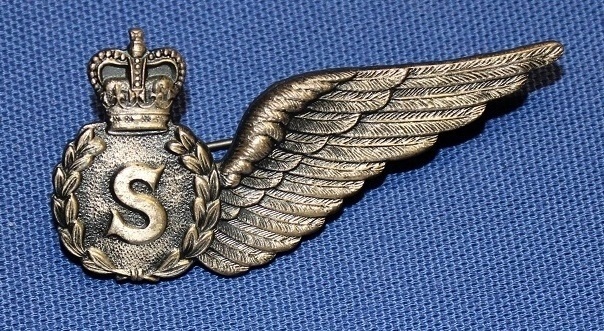 A solid back silver brevet for an Loadmaster with a broach fitting. The brevet is marked "Swann & Hudson Frankston STG"
BV083. Back view of brevet showing markings. BV084. 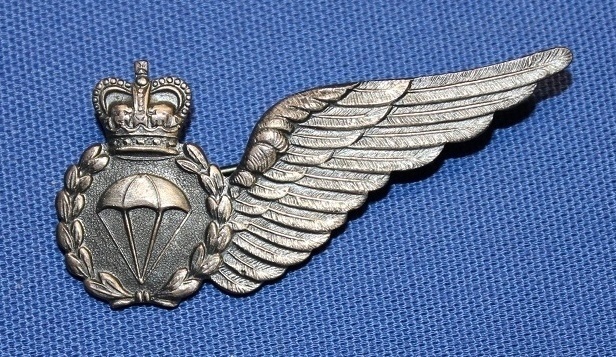 A solid back silver brevet for a Parachute Jump Instructor with a broach fitting. 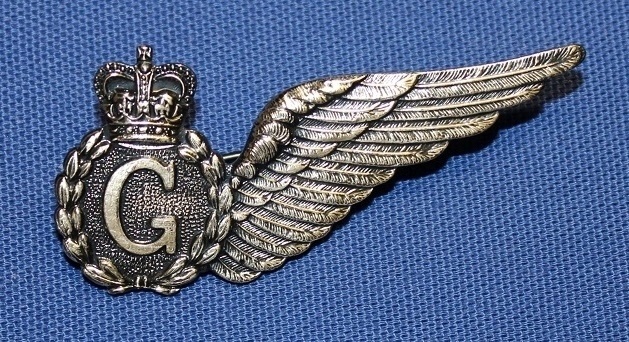 The brevet is marked "K.G.LUKE STG.SIL." BV084. Back view of brevet showing markings. BV085. 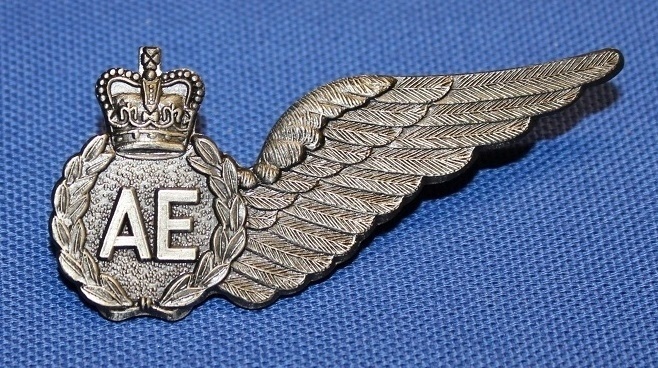 A solid back silver brevet for a Flight Steward with a broach fitting. the brevet is marked "K.G.LUKE STGSIL"
BV085. 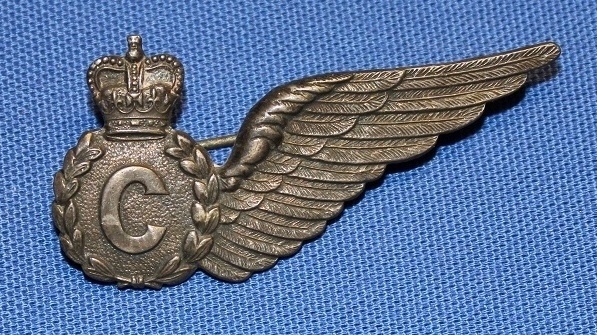 Back view of brevet showing markings.